Pop Culture Prayer Room: How do we pray for murderers? A few months back, sports news was plagued with the story of Aaron Hernandez, tight end of the New England Patriots, shooting a friend (Odin Lloyd) several times to his death. He’s been in jail ever since, awaiting a trial with six charges against him. His arraignment is this Friday, and from there a jury trial date will be set. This whole situation kind of has potential to be the O.J. Simpson trial all over again. If convicted, it’s likely that Hernandez faces life in prison. My heart breaks over every aspect of this story. It breaks for the family and friends of Odin Lloyd, who was obviously mixed up with a bad crowd that ended up costing him his life. My heart breaks over the example guys like this are setting for young men aspiring to be NFL superstars. My heart breaks for Aaron Hernandez, who must be a disturbed individual to do what he did that night. Hernandez lost his dad when he was 16, and according to anyone who knows him, that’s when rebellion began and thing spiraled out of control. Is this an excuse for murder? What if redemption wasn’t out of the question for him? What if we prayed in such a way that we believed that? And what about all the other broken hearts connected to this story? I’m praying for the family and friends of Odin Lloyd who lost a friend, son and brother in the blink of an eye. Lord give them peace, let justice be served for the loss of his innocent life, and after that let grace rule in their hearts and not bitterness. I’m praying for the broken, lost family of Aaron Hernandez to find the Healer so that they can find healing that will last. I’m praying for the next generation of young athletes to become the Godly men and women that I want my children to look up to. Which means I am also praying for the local church to begin to influence the influencers. As soon as this trial begins, there will be people saying all kinds of awful things about it. We have an opportunity to fight that in the spirit. Should we pray for justice? Yes. 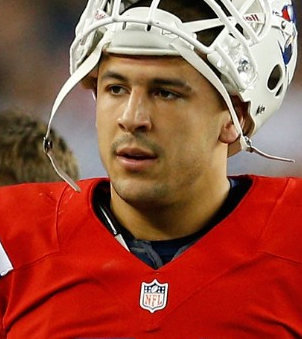 Should we believe that Aaron Hernandez can get what he deserves and still receive grace? You better believe it.